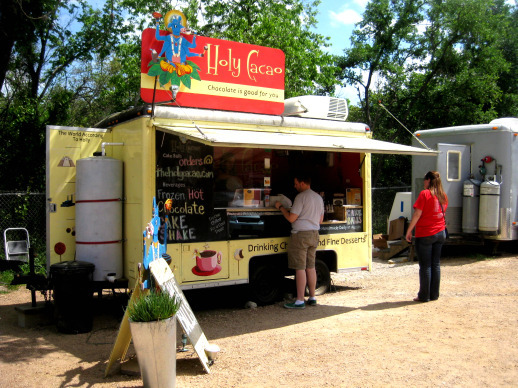 This past weekend, I hit up South Austin Trailer Park & Eatery, my main objective was to try Holy Cacao. I couldn’t help but dabble in another dog at Man Bites Dog, but Holy Cacao was my original mission. 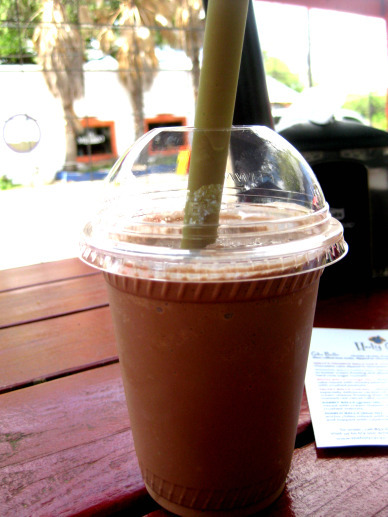 I recruited Dave and his girlfriend to be my eating buddies and while eagerly awaiting their arrival, I treated myself to their frozen hot chocolate. As I sipped on it (or gulped it down, whatever), I made a resolution to always come by and order a frozen hot chocolate here whenever I get my highlights refreshed. My hair salon is just around the corner. It was that good. It had a nice amount of bitterness. My chocolate experience is only complete with some bitterness. Chunks of rich, fresh baked cake are mixed with frosting, then rolled into balls, dipped in chocolate and perched atop popsicle sticks. My eating buddies and I each picked a different flavor of ball and agreed to share a nibble. All cake ball nibbling jokes aside, I loved this strategy as it gave us three wonderful samplings without having to gorge on 3 whole balls. We just had lunch (me, I had two lunches) after all. 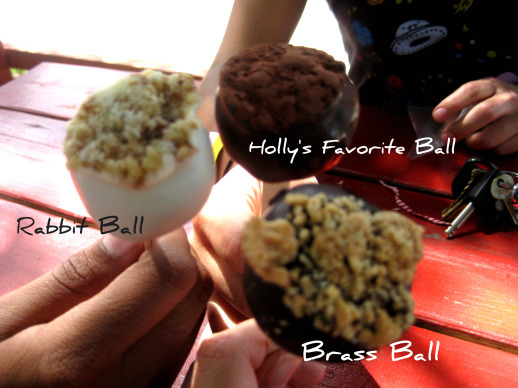 The three chosen were Holly’s Favorite Ball, Brass Ball (my pick), and Rabbit Ball. 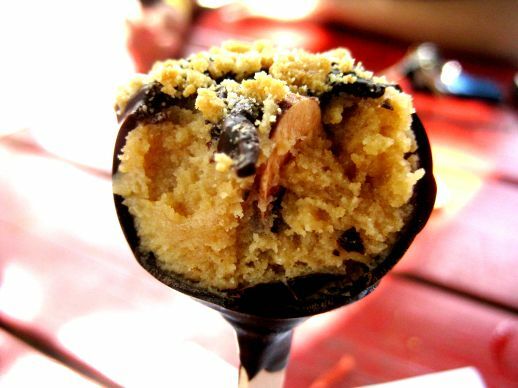 Brass Ball: Peanut butter cake mixed with chunky peanut butter, then dipped in chocolate and topped with crushed peanuts. This was my favorite of the three. It reminded me of my nutter butter truffles. Chocolate + Peanut Butter = Winning Combination. 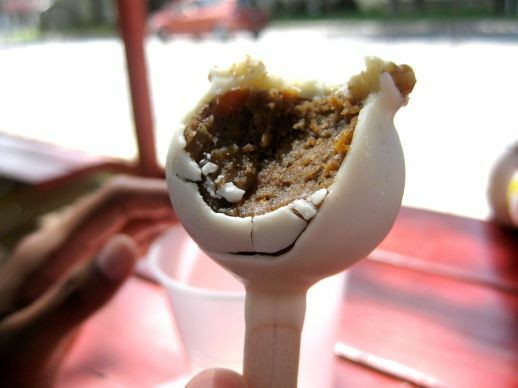 Rabbit Ball: carrot cake mixed with cream cheese, dipped in white chocolate and coated with crushed walnuts. You know, I’m usually not a fan of carrot cake. I think I find them usually too dry for the likes of me. However, these balls, perhaps it’s the cream cheese mixed into the cake, but it’s moist and rich. Luscious. I surprised myself when I found myself enjoying this. Well done, Holly Cacao! 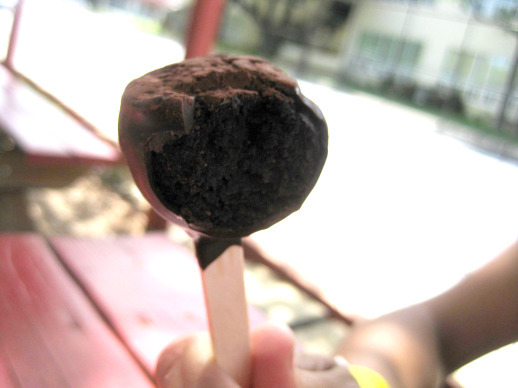 Holly’s Favorite Ball: Chocolate cake dipped in chocolate and dusted with cocoa powder. This was my second favorite! If you’re a fan of rich chocolate and not a fan of peanut butter, here’s the ball for you. Wedding Balls: White cake swirled with strawberry preserves then dipped in white chocolate and crowned with hard rock sugar crystals. Diablo Balls: A chocolate cake baked with ancho chiles, mixed with ancho cream cheese frosting, dipped in dark chocolate and then topped with cayenne and cocoa toasted walnuts. Each ball is in my opinion, reasonably priced at 2 dollars a pop. Get it? 2 dollars a pop? Pop? Email me if you need an explanation ;). If you are interested in making cakeball art, see Bakerella’s website.